ms. brown's classroom: We are AWESOME writers! We have been learning how to write short fiction stories. I am so proud of all of the authors in Room 15! We have learned that stories (usually) start by introducing the CHARACTERS and the SETTING (more characters might come in later though). Then comes the CONCLUSION -- this is where the problem is solved. Then the story has an ending. The reader shouldn't be "left hanging" at the end of a story! Here is an example of *someone* in Room 15 reading his story. Watch for more to come! We are already moving from our simple stories, to stories that have more interesting words -- more description and detail. 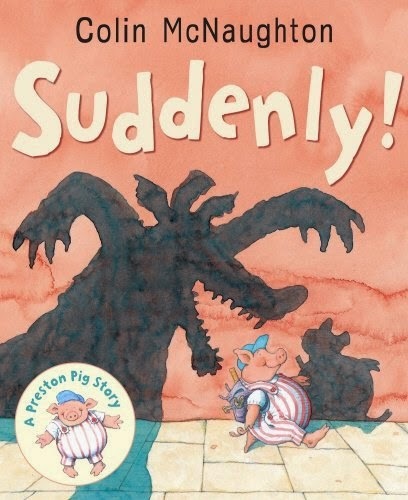 We read a book called Suddenly by Colin McNaughton. They really liked the simple "plot twists". I expect the word suddenly to feature in many of our upcoming stories :) I had to add it to our word wall.